Since Subversion keeps a history of all files, you cannot simply delete some files to reduce storage. Instead, you have three options. Upgrade to the next plan. Export your repository (for backup), delete the repo, then archive and import your working copy again without the files you don't want. Use "svndumpfilter" utility to edit history of the repository. Keep in mind, Option 2 will start you over at revision 1 and you will lose all revision history. The current files will still be in tact, but you will not be able to review past revisions. For Option 3 you have to use command line utility called "svndumpfilter". It will allow you to delete unnecessary files from your repository by updating Subversion history of the repository. Read our help article about svndumpfilter for more details. 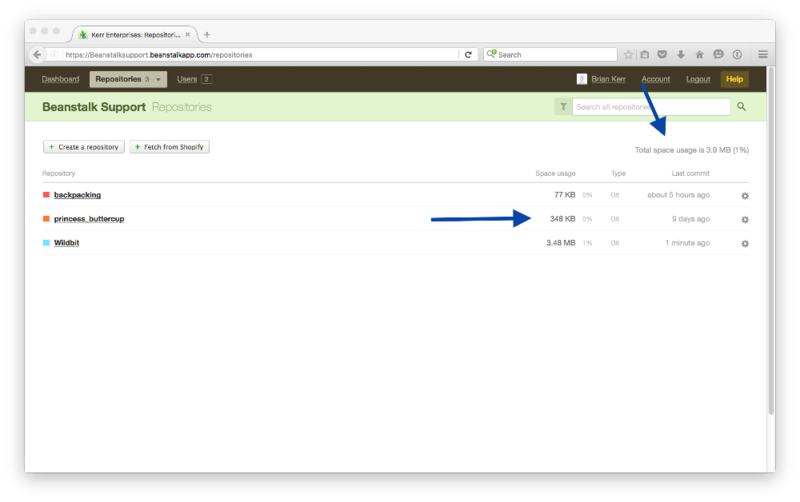 If you want to check the amount of storage your account click on the “repositories” option in the Beanstalk top header. On the right it will list the total amount of storage for your account and each repository will list how much storage it uses.